Silly Season is well underway on the NASCAR Sprint Cup Series, with a handful of drivers mulling new opportunities for 2017 and beyond. Baldwin is "exploring all opportunities." New to the Silly Season dance, however, is the concept of team owners selling or leasing their competition charters to other organizations. As least two NSCS owners are openly discussing the possibility of unloading their charters in coming weeks, with others looking to acquire the guaranteed starting spots and increased purse and point fund payoffs that come with being a chartered team. 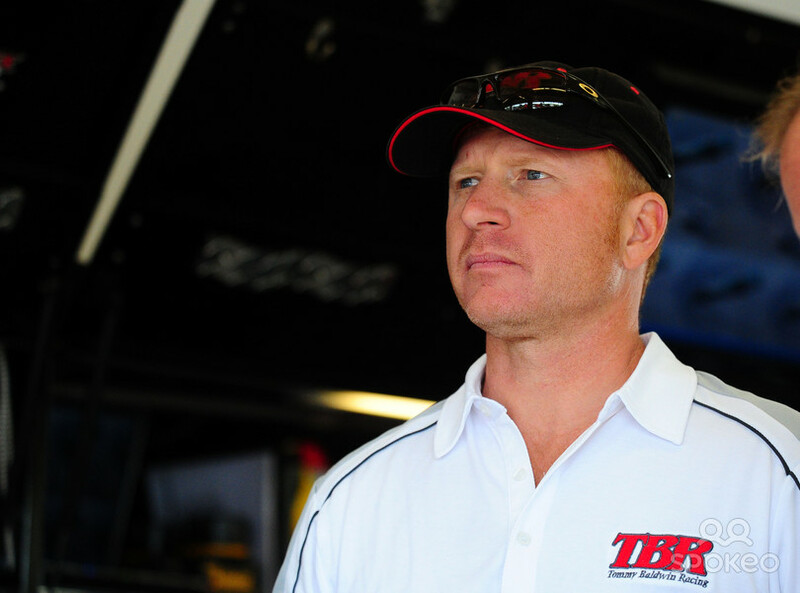 Team owner Tommy Baldwin, Jr. is expected to sell his Sprint Cup Series charter to Leavine Family Racing for the 2017 season. Baldwin met with his employees last week to “give them the options if they needed to go find a job,” and multiple published reports have the Long Island, NY native ready to sign documents on the transfer in the coming days. The former NSCS crew chief-turned owner confirmed that he is “exploring all my opportunities right now… trying to figure everything out.'' Baldwin told NBC Sports he is not interested in shutting down his team, which made its initial Sprint Cup Series start in 2009, preferring instead to sell his charter – and possibly the assets of his team – to another organization. "The options are (to) keep going, or sell,'' said Baldwin, who has fielded Chevrolets for driver Regan Smith this season en route to 33rd place in the championship standings, with one Top-5 and two Top-10 finishes. 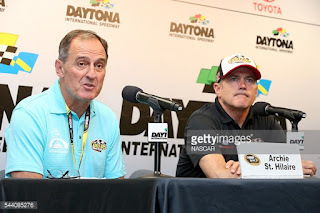 Their best finish of the season – a third in the Pennsylvania 400 at Pocono in early August – was not enough to attract additional sponsorship to the team, forcing Baldwin to confront the looming possibility of shuttering or selling the team. Baldwin has reportedly found a willing buyer in Leavine Family Racing, which currently partners with Circle Sport Racing to field Michael McDowell’s No. 95 Thrivent Financial/K-LOVE Chevrolet. Team owner Bob Leavine has leased a charter from Joe Falk Racing this season, on a one-year basis. NASCAR rules allow such an arrangement for only one year, however, and Falk will be forced to either use his charter in 2017, or sell it outright. Leavine Family Racing Vice President Jeremy Lange confirmed last week that his organization is, in fact, purchasing a charter for 2017, but would not name the seller. St. Hilaire (L) is also looking. While Baldwin and Leavine dot the “I”s on their deal, GoFas Racing owner Archie St. Hilaire is considering his options, as well. St. Hilaire told reporters last week that he would be willing to lease his charter next season, or partner with another chartered team in an effort to help his operation grow. NASCAR rules state that if a chartered organization finishes in the bottom three (of 36 charter holders) in three consecutive seasons, their charters can be revoked and awarded to another organization. “Anybody in the bottom three is exploring all their options right now,'' admitted St. Hilaire, who has fielded his No. 32 Ford for a revolving-door lineup of drivers this season, including Bobby Labonte, Jeffrey Earnhardt, Joey Gase, Jeb Burton, Eddie MacDonald and Boris Said. The team is currently 38th in the championship owner’s standings. St. Hilaire says he hopes to have a 2017 plan in place within the next 30 days. While it’s always unfortunate when team owners face the end of the line, Baldwin and St. Hilaire are better off than they would have been as little as two years ago. Prior to the advent of NASCAR’s Charter System, they would have been left with little to sell but a few race cars, parts, pieces and transporters. There is usually not a long line of buyers for older, mid- to back-of-the-pack equipment, however, meaning that both organizations would be liquidated for mere pennies on the dollar. Now, Baldwin and St. Hilaire own two of just 36 Sprint Cup Series charters, complete with guaranteed starting spots in each race, along with purse and point fund payouts large than those awarded to non-chartered, “open” teams. Depending on demand on the open market, those charters will almost certainly be worth multiple millions of dollars. With Leavine Family Racing openly looking to buy, Furniture Row Racing expending to a second full-time operation with driver Erik Jones and JTG Daugherty Racing also reportedly planning to expand to a second car in 2017, both Baldwin and St. Hilaire stand to cash a much larger exit check than ever before possible in the history of the sport. At the very least, they will be able to lease their respective charters for a season, allowing them time to regroup, forge new alliances and court additional sponsorship. That opportunity has never existed before. I'm not seeing that this charter system is accomplishing anything, for St. Hilaire and Baldwin are basically left without ability to continue and their teams will be disbanded and the equipment dispersed anyway. And the notion that the Charter system is allowing them time to regroup etc. isn't really different from before. Well it has been all quiet on the front regarding the advancement or hell anything regarding the "Racers Alliance", but we sure hear a lot about the poor teams not in inner circle and their struggles. Sad..and unnecessary on so many levels. The sport is dying..and nobody seems to know how to fix the spiral, or care. In my opinion. Yes the Charter does give some value to the owner when it comes to selling but what value does it have in enticing new owners to get into the sport? Who can come in (with or without a good sponsor) and make a go at it when they are facing tough odds each week to even make a race? And then you have to deal with Mother Nature and NASCAR so quickly cancelling qualifying and ranking on points as if that is not important. I think qualifying is way more important than practice time. I'd be astounded if Erik Jones raced without a charter to back him up. Even if the long-term plan is to move him to a bigger Toyota team, he knows better than to sign a charter-less deal for even one year. What is Frank Stoddard's role with the #32 team now? He was the owner before merging with or being acquired by Archie St. Hilaire. These charters are a joke. Before long they will have as much value as a Rockingham season pass. How much did Tommy get for his Charter, Andy? Do you know? And if not, how do you know they're a "joke?"